Let us try to discuss and solve them. Which number should replace the ? 4 , 9 , 19 , 39 , 79 ? Now analyse the trends of answers ,we are getting double of the previous number as a result every time . Similarly if we follow the same trend from 79 to next term ,then we shall get 80 as answer. So to get 80 as answer "Add 80 to 79 to get 159 ". when we subtract 79 from 159 ,we get the double of the previous result . So final answer is 159 - 79 = 80. Therefore " ? " will replace 159 as Answer. But before we proceed to discuss the Puzzle-1, let us discuss some of the necessary keywords/definitions which have been used in it. When any Number is divisible by 2 then that number is called An Even number . If we take 2,16,84,22,20,100 etc then they are Even Numbers as they can be divided by 2. 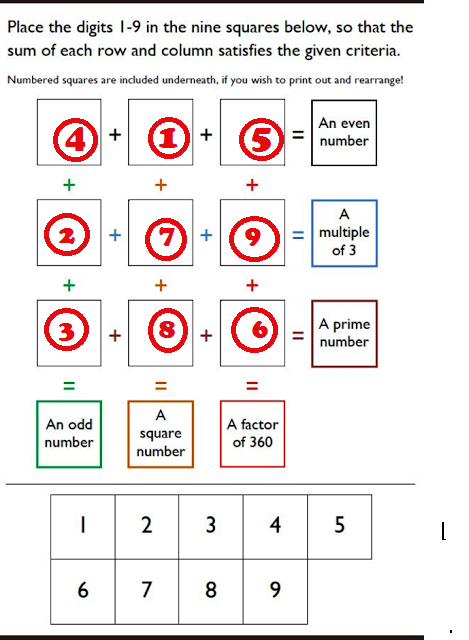 When any number is NOT divisible by 2 then that number is called An ODD number .If we take 21,15,49,21,57,101 etc then they are Odd Numbers as they can NOT be divided by 2. An number which is divisible by 3 or which comes in the table of 3 is called multiple of 3. if we take 57,102,69,9,6,21,39 etc numbers , as these numbers comes in the table of 3 or these are divisible by 3 , so they are Multiple of 3. Any number which has only two Factors 1 and the numbers itself is called Prime number. 1 is not the the prime number, 2 ( It is the 1st prime number ) , 3,5,7,11,13,17,19,23 etc are examples of Prime numbers as these numbers have only two factors 1 and the number itself. Any number whose square root is a Natural number is called square Number . such as 1,4,9,16,25,36,49,64,81,100,121,144 etc. Have you still not visited "HOW TO SOLVE HARD AND IMPOSSIBLE PUZZLES PART 1"
Analyse the Answers above , we get 4,6,8,10,12,14,16,18 and 20 . Is there any relation between them. Of course , Because every answer is 2 more than the previous Answer. 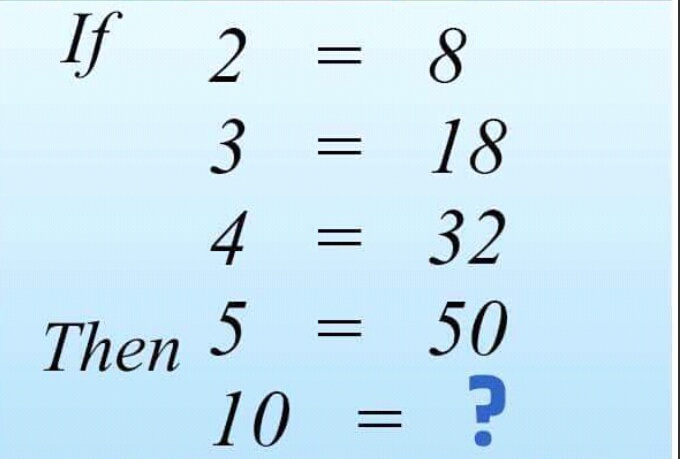 So Last number should be 200. so in order to get answer 200 we have to multiply 20 with 10. In order to get any number any of any term based upon this trends we can use the formula 2n^2 , where "n " is the number appearing on left side of the Puzzle. Here is the Solution of the Puzzle asked in "HOW TO SOLVE HARD AND IMPOSSIBLE PUZZLES PART 3" as follows. Thanks for devoting your valuable time for this post "How to solve various Hard and impossible puzzles ,Quizzes , Brain Teasers and challenges " of my blog . If you liked this this blog/post, Do Follow me on my blog and share this post with your friends . We shall meet again in next post with solutions of most interesting and mind blowing puzzles ,till then Good Bye. 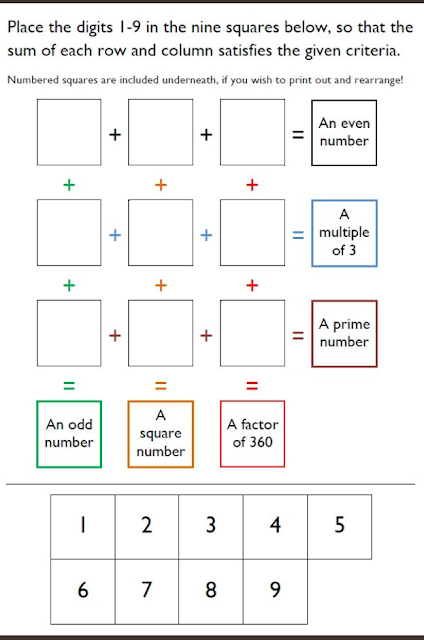 To Solve more Maths Puzzles ,Maths Riddles and Brain Teasers , Buy the book Given Below .